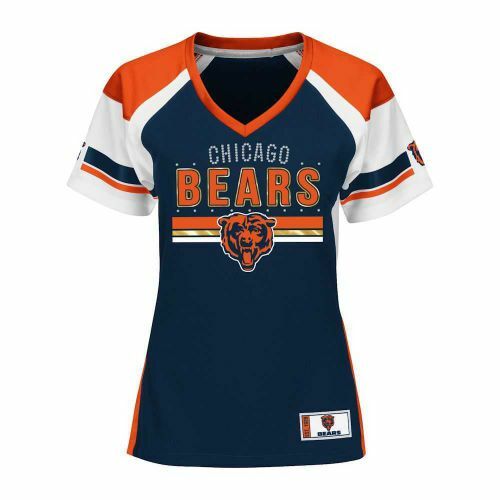 Chicago Bears ladies plus Draft Me top by Majestic is navy with white sleeves and orange trim and has the Bears logo screen printed on the shoulders along with navy and orange stripes and has Chicago in crysals along with BEARS and stripes and the logo with more rhinestone accents screen printed on the front and a jock tag at the lower left hem. Available in ladies plus size 1X only. 100% polyester (HERDRAFTEDBE) Majestic Women's Plus is generously sized for full figure women. Service Area: Shawano, Appleton, Stevens Point, Oshkosh, De Pere, Wausau, Menasha, Kaukauna, Schofield, Clintonville, Seymour and surrounding communities.